Peter Pan is a classic Disney film that celebrates the magic of childhood. In this tale, Wendy Darling and her brothers Michael and John join Peter Pan, Tinker Bell, and The Lost Boys on an exciting adventure that highlights how important it is to always use our imaginations and that nothing is impossible if we believe in it. The story also reinforces the fact that the power of a friendship can last a lifetime. Peter Pan’s Never Land by Thomas Kinkade Studios captures the adventure of the magical place that Peter Pan and his friends call home. In this scene, we see Peter battling his nemesis Captain Hook, with the help of Wendy, Michael, John, The Lost Boys, and his beloved pal Tinker Bell. The friends fly together with faith and a dash of pixie dust, while the Mermaids look on and a beautiful rainbow sits brightly in the sky. This painting reminds us that although we may grow up, we should view the world with the wonderment of a child, no matter our age. It also reinforces the fact that the bonds of a true friendship can lift us up throughout our lives. The Disney film, Peter Pan, was based on a theatrical play of the same name by Sir James Barrie. Walt Disney was touched by the story as a child. He watched it with his brother, Roy, and went on to star as Peter Pan in his school’s performance of the play. Walt delighted in the magic of all of the characters, and felt great pride in bringing them to life in his full-length animated movie. Peter Pan was released to critical acclaim on February 5, 1953. Adults and children alike connected with the story and its positive message. Peter Pan’s Never Land by the Thomas Kinkade Studios is the second Limited Edition artwork to pay tribute to the Peter Pan franchise. 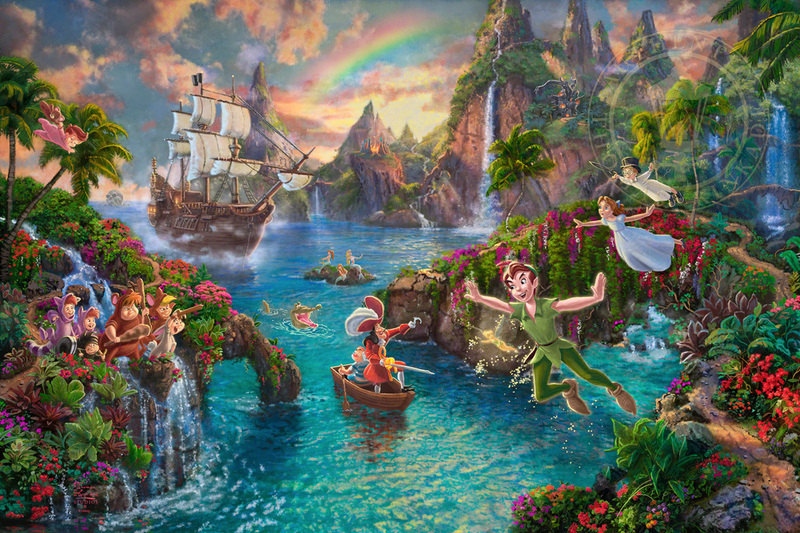 The first image was Tinker Bell and Peter Pan Fly to Never Land – released in 2009 by Thomas Kinkade and subsequently sold out in Limited Edition Canvas and Paper. To get to Never Land, Peter instructs Wendy, Michael and John Darling that they must fly towards the “second star to the right and straight on ‘til morning”. The Lost Boys are six children who, according to Peter, fell out of their baby carriages while their nurses weren’t looking and now follow him in his adventures. These loyal friends include Foxy, Rabbit, Skunk, Cubby, and the Raccoon Twins. In Peter Pan’s Never Land, Captain Hook and Mr. Smee face Peter Pan in a row boat while the Crocodile who ate his hand happily hopes for his next meal. In the background sits the Jolly Roger, Hook’s pirate ship. Beyond the cove lies Skull Rock, where the villains once held Tiger Lily. Up on the bluff sits the Indian Camp, where Tiger Lily, the Indian Chief, and their people live. Across the way is Hangman’s Tree – the entrance to Peter Pan and The Lost Boys’ home, and below that is Mermaid Lagoon and Marooners’ Rock, where Peter’s magical friends frolic all day.